Researchers Sasha Tetu, Katy Breakwell, Liam Elbourne, Andrew Holmes, Michael Gillings and Ian Paulsen from Macquarie University, are exploring how this alien ecosystem works. They published their findings this week in the journal of the International Society for Microbial Ecology, showing that an unusual combination of microbes thrive in the Weebubbie caves. 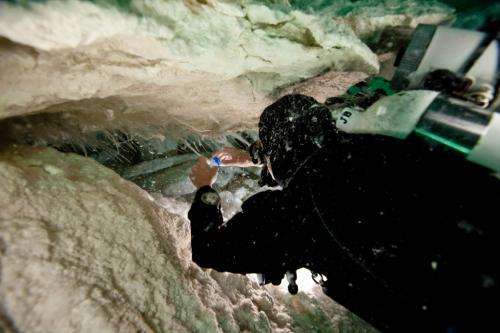 "Earlier studies on the community suggested that there was an unusual chemistry going on in the caves, but we didn't know how the microbes were making a living in the cave environment," says the lead scientist Professor Ian Paulsen, Macquarie University. In order to find this 'missing link', the team of researchers made use of a range of new technologies, such next-generation sequencing of environmental DNA and scanning electron microscopy to take an in-depth look at the composition of the Weebubbie cave slime community. This approach detected a dominant group of organisms in the cave slimes, known as the Thaumarchaeota. This community of microbes thrives in the total dark, independent of photosynthesis. It is thought that the periodic inundations of the Nullarbor caves by the sea occurred a number of times in the geological past and so researchers suggest that the Weebubbie Thaumarchaeota may have a marine origin. The research team says this analysis shows that the organisms make up the Weebubbie cave slime community make their living in a very unusual way – by oxidizing ammonia in the salty cave water – and are completely independent of sunlight and ecosystems on the surface. "It just goes to show that life in the dark recesses of the planet comes in many strange forms, many of which are still unknown," says Professor Paulsen. Why "alien" in the title???? Editors!!! alien, adj. unlike one's own; strange; not belonging. Do you oxidize ammonia? Do you know of anything that lives that oxidizes ammonia? Maybe these critters could live on Neptune or even Uranus. This article feldspar short of my hopes. They're just trying to fill plagioclase. Have to be careful diving down that deep- you can catch ammonia. They used that word because it resembles something from an alien movie. And also because the organisms have formed their own independent ecosystem. The big question in my mind is: How closely related are Ghost of Otto and the newly-discovered slime ? Looks to me like if they ate that, they might well be able to do long division. Our conservative Liberal party is on some sort of party conference under the Nullabor, it must be them. If you look carefully, the cave diving journalist appears to be interviewing the Leader Of The Opposition. Dog gone! Make a decent article about how different life can be or how far it can adapt and present it: and out come the trolls! Because such a word will attract the attention of readers subconsciously. Did you read about subliminal commercials?